In the early morning of June 28, 1689, the settlement of Cocheco, New Hampshire (now part of the city of Dover) was attacked by Indians. Five fortified garrison houses were targeted, including that of Richard Otis, the town’s blacksmith and one of its leading citizens—my ancestor. Many events led up to that fateful morning. The Indians resented the white settlers, and they held a particular grudge against Major Richard Waldron, head of the settlement's militia. In June of 1689 they began to gather, ostensibly for trading, but they also took stock of the settlers’ defenses. Several of the colonists had fortified their homes under orders from the governor during King Philip’s War. These homes were chosen for their location on hilltops or knolls, and were essentially large, sturdy log cabins with huge central chimneys. The upper story projected slightly over the lower, with holes or loose boards in the overhang, so that hot water or bullets could be rained down on attackers. Eight-foot palisades with watchtowers were built around the houses. In case of Indian threats, neighbors took shelter at these garrisons. There were about fifty of them across the colony. On the evening of June 27, a few Indian women asked for shelter at four garrisons. This had become customary. The householders not only let them sleep inside their palisades when requested, they also showed them how to open the gates in case they wished to leave during the night. It seems no watch was kept at any of those garrisons that night, and all the settlers went unsuspecting to bed. Here’s the “short version” of what happened at Waldron’s, Otis’s, Heard’s, Peter Coffin’s, and his son Tristram Coffin’s garrisons. During the predawn hours of June 28, the women opened the gates and admitted several hundred Pennacooks into the undefended garrisons. Waldron, age 74, was captured, mutilated, and brutally murdered with his own sword and his house was burned. His family was killed or captured. 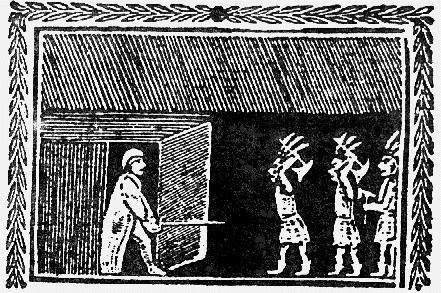 Woodcut depicting the attack on Major Waldron's home. 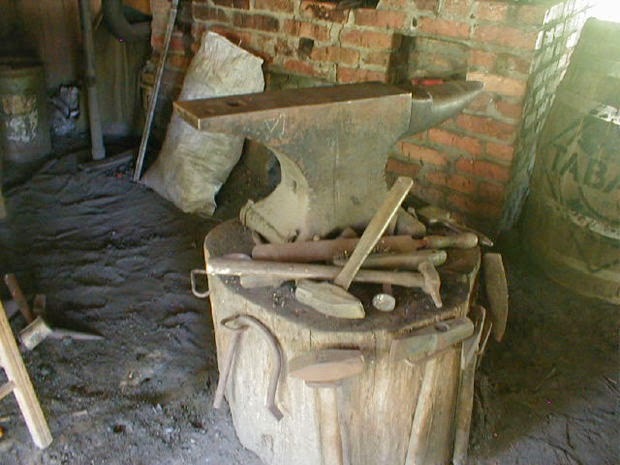 At Richard Otis’s garrison, the 64-year-old blacksmith, his son Stephen, and daughter Hannah were killed. His third wife, Grizel, three-month-old daughter Margaret, three daughters from his first marriage, Judith, Rose, and Experience, and at least two grandchildren were taken captive. One adult son, Richard Jr., escaped. The garrison was burned. In 1911, construction workers rediscovered the site. Artifacts recovered include: bolts, nails, barrel hoops, clay pipes, spoons, a tomahawk, the bow of a pair of spectacles, an ox shoe, bricks believed to be from the chimney, blacksmith’s tools, and human and animal bones. The relics are now on display at the Woodman Institute in Dover. At the Heard garrison, a different scene took place. Old Elder William Wentworth was staying at the house while the owner, widow Elizabeth Heard, was away. He was awakened in the night by the barking of a dog. He was able to close the gate the women had opened and hold it fast. One account says he lay on his back, with his feet propped against the gate, until the Indians gave up pushing on it and went elsewhere. This was the only garrison in Cocheco unscathed that night. The owner, widow Elizabeth Heard, with her four adult children and their families, had sailed the previous day to Portsmouth. They were returning with the tide to Cochecho at dawn on June 28. Finding the docks and main street deserted, they headed cautiously for Waldron’s home, the nearest garrison, and soon smelled smoke and heard war cries. Alerted to the danger, the family agreed to flee to the Gerrish garrison at Back River. Elizabeth, however, was terrified and elderly. She didn’t think she could make the journey and begged her family to hide her in the bushes and leave her, which they reluctantly did. She later reported that one of the Indians saw her, but he was one she had done a kindness for in the past. He did not harm her or reveal her location, and she survived. When the Indians had left, she walked to her own home, expecting to find it a pile of ashes. Instead, she found Elder Wentworth and her house intact. At Peter Coffin’s garrison, the house not burned because of Peter’s past friendship with some of the Indians. He and his family were taken captive, however, and marched to his son Tristram’s garrison. It seems none of the Indian women had sought shelter at Tristram Coffin’s; however, that isn’t certain from the sources used. While Tristram’s home was so well fortified the Indians could not get in, they forced him to open the gate by threatening to kill one of their hostages. He let them in to save his family. The Indians plundered his home, but all of the family was spared and the house was left standing. In all, about eight houses were burned that morning, as were the gristmills and sawmill at Cocheco Falls. Twenty-three people were killed, and twenty-nine taken captive, many from the Otis family. Colonists pursued the Indians, who split into smaller groups with their captives. The three older Otis girls were rescued near Conway, including Judith, from whom I am descended. Most of the captives were taken to Canada. Richard Otis’s young wife, Grizel, and her baby went to Montreal and were treated kindly. Grizel’s name was changed to Madeline, and she later married a French Canadian farmer and had five children with him. She stayed in Canada, as did most of the captives when later given a choice. The baby, Marguerite, was raised by nuns in Montreal, and her name was changed to Christine. She lived in Canada until she was 45 years old, though she could have returned after a prisoner exchange in 1714. After returning to New Hampshire in 1735, she and her husband established a public house there. For the next 60 years, Indian raids continued in coastal Maine and New Hampshire. By the middle of the 18th century, the advancing whites, famine, and disease had subdued the natives. 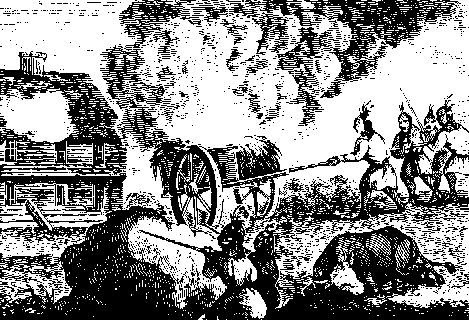 By 1770, very few Indians were left in New Hampshire. The William Damme garrison is the only New Hampshire garrison house remaining intact today. It was moved in 1915 and has been preserved in a pavilion at the Woodman Institute in Dover and can be visited there. It contains many period relics, and artifacts from Richard Otis’s garrison that was burned in the 1689 massacre. second book, had been an indentured servant in New Hampshire. In Canada, she was married off to a farmer. Christine, the heroine of the third book, was entrusted to a convent. These stories start with the young women’s return to Cocheco and follow them as they assimilate back into the English-American culture. To enter the drawing for a copy of the anthology White Mountain Brides, leave a comment below, including your contact information. E-readers may substitute an e-book of any of the three individual books from this series. Susan Page Davis is the author of more than forty published novels. A history major, www.susanpagedavis.com . Susan, My what interesting ties you have to the past. I thoroughly enjoyed reading this great history and I thank you so much for sharing it. Thank you also for the generous giveaway. Your' welcome, Melanie, and thanks for your encouragement. It was a very moving experience when my sisters and I visited the museum and saw the nails and other items that Richard Otis probably made with his own hands. Very interesting! This sounds like a great story, I would love to win "White Mountain Brides" and read about what happened to the girls. Thank you for the chance. Thanks, Wendy. Messed up my first reply, so trying again. This story has fascinated me for a long time. I always find these historical recollection both interesting and sad. Somehow after all these hundreds of years the stories remain to remind us of our ancestors bravery. Your series sounds extremely interesting. Count me in the drawing. cindyshuff (at)comcast (dot) net. Thanks, Cindy. You're entered. I know what you mean about the sadness these account evoke. Every person involved could have a story written about him or her. Their acts of heroism and endurance remain, and I'm glad eyewitness accounts have been preserved. I was not familiar with any of this history. It was very interesting how each place was attacked and the failures of the people to protect them. The Indians appeared to be very skillful in planning their attacks and how strange they could stay at night with no oversight. It is so nice you can track your ancestry so far back. Glad you came by, Jackie. One interesting thing is that not all of Richard Otis's children were at his home the night of the attack. Several were adults and had their own homes. He was 64, and had survived 2 wives. Another son, Nicholas, was killed by Indians seven years later. The warriors ambushed a group of the local settlers as they returned home from church on Sunday, July 26, 1696. Nicholas's wife was also killed, then, and a son was captured. His sister, Experience (also a daughter of Richard, one of those many believe was among the captured and rescued in 1689) was wounded and scalped in the 1696 ambush, but survived. A contemporary journal says she lived to have one child, but died chiefly of her wounds. So sad! Susan, this post is very interesting. I'm always amazed at the trials and hardships of the early settlers, and how they coped. It must be exciting for you to have found the history of some of your ancestors. Thanks, Kay. It really was. There is a lot more material about the Otis family--I haven't told half of it. One very sad thing to me was that these people had lived 50 years in peace with the Pennacook up to that time. I love reading about the first settlers. My husbands family can trace back to the Mayflower. Oh, that is so cool, Dorie! Maybe we have a connection. My mom was a John Alden-Priscilla Mullins descendant, and my husband is descended from the black sheep Billington family of the Mayflower. Who is your Mayflower ancestor? My parents both immigrated from Russia so I have no real history in the USA except that I was born here. I love reading the stories of the early settlers. Thanks for the giveaway. Wow, Betti! I have a dear friend whose family also came from Russia, and it must be hard not to have the backstory. I love reading about the old days and the ingenious ways in which our ancestors coped. My paternal family was in New England for 400 years, and one thing I thought was interesting was all the different devices they had back then to help them keep warm! Wow Didn't know that part of your history either and to have that happen to an ancestor. It would be hard to trust the Indians ever again. I tend to hear more of the tribes in the west although did hear about the ones in Jamestown when in America. Hey, Jenny, I'm glad you're here! I wanted to say (and forgot) that people who live outside the US and Canada can enter this giveaway for an e-book if they wish. And you're right, we tend to hear more about the western Indian wars. But the east coast tribes had plenty going on, even before Europeans arrived. One thing I didn't spend a lot of time on for lack of space, though: in the case of this massacre, the Indians felt they were justified because of things that had been done to them and their friends earlier, during King Philip's War. I had to cut my post WAY down because it was too long. There were some not-so-nice actions on the part of the whites as well. Oh my, I would love to read this book. And the backstory is wonderful! This is the kind of history I really enjoy, when it's personal and you can relate to the people involved. Thanks for the giveaway! It was very personal for me, even though the events took place more than 300 years ago. Thanks, Connie! Such a fascinating post Susan! I used to live in Portsmorth but know very little of the history of the state, unfortunaTely. Would love to learn more from your White Mountain Brides anthology! When my sisters and I visited the museum in Dover, we stayed over in Portsmouth and had lots of fun there. You still have a few cobblestone streets, if I remember right, and we found an all-mystery bookstore in a cute little alley. A couple of years later, my daughter and I went back to see an equestrian event at the university. That's true, Eliza. And most of the captives refused to come back later, once they had lived among the Indians or the French for several years. This was very interesting. I really enjoyed reading about this happening. I think it was neat that the Indian women was able to stay over night, but pretty dumb, in my opinion to show them how to open the gates when they were built so the people inside would be protected if there was attack. And, they never knew when one would happen. Wonder why the baby was sent somewhere else. I would be very happy to have my name drawn for your book. Yes, apparently the women had been doing this for some time and had gained the settlers' trust. The major had been warned that an attack was in the works, but he was overconfident of their ability to repel it. As to the captors taking the baby away from the mother, I think the captives were often separated to make them assimilate more quickly and lose their ties with their old culture and family. I did extensive research on Indian captivities in both east and west, and this seemed to be a pattern. Keep them more or less isolated until they became part of the new culture. And the mother wasn't in any position to object, when she'd seen her husband shot and her 2-year-old daughter brutally killed at the house. In Texas in the mid-1800s, one of the first thing captors did was to strip the captives of their clothing. They would not let them dress in "white man's clothes" or speak English. Children who were not recovered within 6 to 12 months generally did not want to go back to the white culture. Wow, very interesting. Crazy to think that their generosity of sheltering the women got them betrayed. Thanks for sharing. Yep. You just never know, do you? Thanks for coming by, Susan. You and me both, Sharon! I love to read about it, but I enjoy my comforts, and I can't imagine living in a time and place where you were also in that kind of danger. And the winner is....Dorie! Congratulations. I will contact you privately. Thanks a lot to all who came by and took part in the drawing. Blessings! Just found this site this evening while researching the Cocheco Massacre. I too am a descendant of Richard Otis through his son Richard Otis Jr. I will have to see if I can locate your stories. :) Thank you for sharing their story. Jessica, thanks for stopping by. My NH books are fiction, but I put in as much authenticity as I could. I mentioned the Otis family but didn't make them the main characters. These stories are close to my heart! I hope you enjoy them. Hello Susan. My name is Jean-Pierre Otis. I live in the Province of Quebec. I am also a Richard Otis descendant through John. His mother was Anna Shuah, Richard Otis's second wife. John was taken captive in 1689 and brought by the Indians (Abenaquis) in the Quebec City area. Hi Susan. I am also a Richard Otis's descendant through John. His mother was Anna Shuah, Richard Otis's second wife. He was taken captive by the Indians Abenaquis and brought to the Quebec City area in 1689. I live in the Province of Quebec. My name is Jean-Pierre Otis. Wow, hello, cousin! I thought Richard's second wife was Susannah Heard, mother of Francoise Rose and Jean Baptiste Otis. Are we talking about the same John? I have been to Quebec several times, and it's fascinating. Judith is my ancestor. Welcome! My Richard is the one born about 1626. He had a son Richard born about 1650. Which one did you mean? I also am a descendant of Richard Otis through his daughter, Ann whose mother was his first wife, Rose Stoughton. I knew about this massacre, but really enjoyed your summary. I was wondering if I could use it as a portion on a presentation at a family reunion in June. I also am interested in the White Mountain Brides series and look forward to reading them. Yes, Janet. It was really hard to cut down the massive amount of material I had. 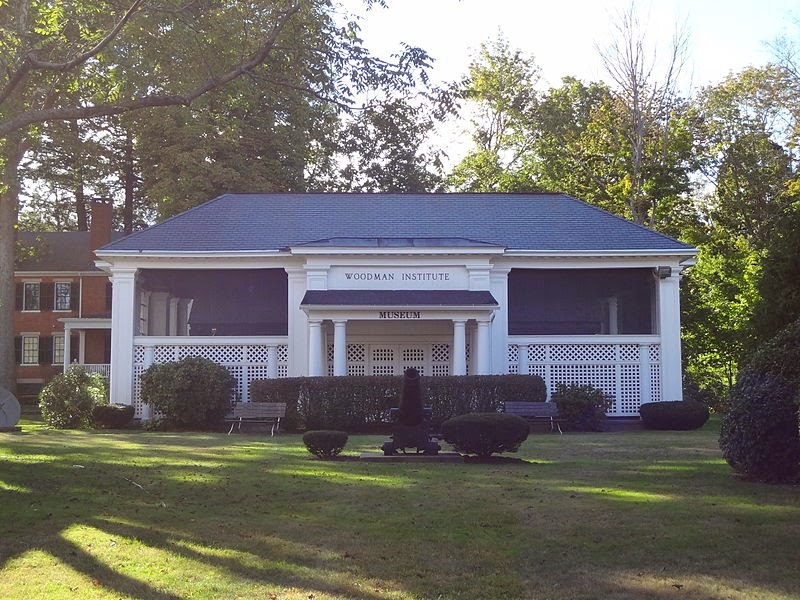 If you live in New England, I recommend you visit the museum (Woodman Institute) and also the library in Dover. They have a lot of material between them. I do not live in New England, but plan to visit both the Woodman Institute and the library in Dover the next time I visit. Where can I find the White Mountain Brides books? Janet, you can find the White Mountain Brides collection or the individual books on Amazon. It's out of print but still available in used or remaindered paperbacks or e-books. The individual books are Return to Love, A New Joy, and Abiding Peace. I just came across this page as I was researching my 10th great grandfather, Richard Otis. So, I guess we are cousins :-) Thank you for the nicely written synopsis of his last day. Very sad and very brave. I am making plans to visit the museum, but have to wait until the spring. Stay well. Glad you found us, Coleen. Visiting the garrison house was very emotional for me and my sisters. Seeing the artifacts is truly a moving experience. I am also another descendant of Richard Otis. He is my 8th great-grandfather. I also descend through John, who was taken by the Abenaki Indians to Canada. There is some thought that he was the son of Sus(annah) Shua Starbuck (Heard), but I am now finding that he may have been Richard's (1625) grandson. His parents would have been Richard Jr. (1650) and Susannah Hussey, which is why I think it became so confusing (both Richard's being married to Susannah's). My french Canadian ancestry starts with this John who became Jean Baptiste. My Otis name carries all the way down to my grandmother. And you are absolutely right about the wealth of information on the subject. I'm currently reading three books covering the Otis family. I also have a blog and I'm in the process of writing John Otis' story. So great to see so many cousins on here. I hope to visit Dover one day and visit the museum. With kind regards. I really want to find some document about our common ancestor, Jean-Baptiste. Many sites disagree on who is his mother. Is he the son or grand-son of Richard Senior? As someone pointed out in another comment, which Susannah is married to which Richard? I am a descendant of Richard Otis and his first wife Rose. I descend from daughters Judith and Martha and son Stephen. I am curious as to how Stephens daughter Mary escaped capture and death to marry Silas Varney.